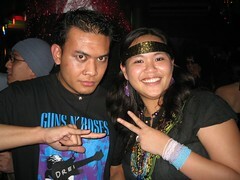 As expected, a lot of people came as hard metal rockers during our rock-themed Christmas party. I was the only one who thought of going as a hippie rocker, cool! For the meantine, some pictures here. Still in the process of collecting pictures from other cameras.